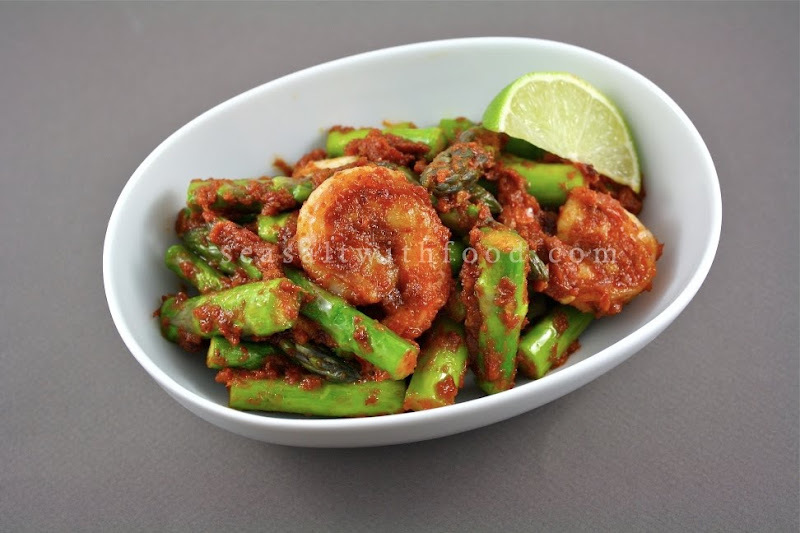 This is a very spicy stir fried asparagus dish. Belachan or Shrimp paste are widely used in Southeast Asia cuisine. They usually come in a rectangular block form. A little bit, does go a long way. So, make sure you use it sparingly and remember to roast it too. 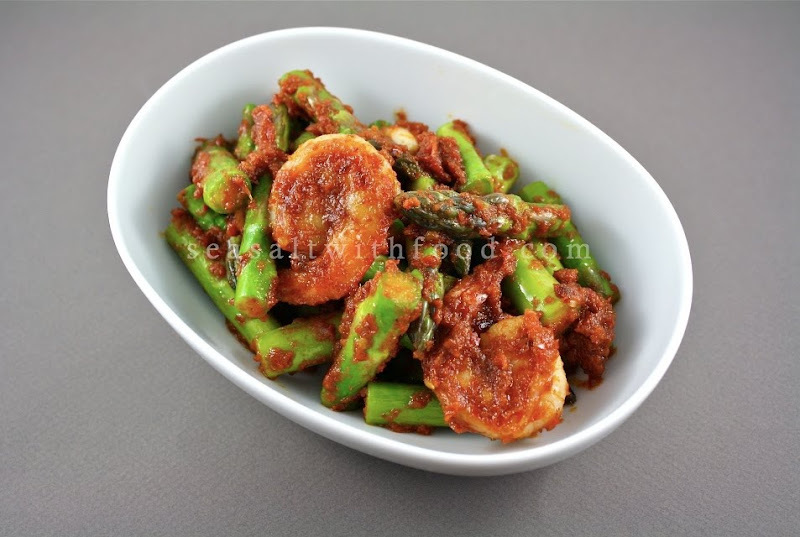 For this dish, the shrimp paste are added in the process of making the sambal. To make the sambal, soak the dried chili pieces with boiling water until they are soften. Drain the chillies and make sure to get rid of the seeds. Then combine it with shallots, candlenuts, shrimp paste and blend them, until they become a paste. Heat 3 Tbsp of Peanut oil and cook the sambal paste in a low heat. Saute until the sambal is fragrant, add the sugar and sea salt to taste. Dish out and set aside. In a wok with high heat, add the remaining 1 Tbsp oil with the garlic. Saute briefly and add in the prawns and cook until they are pinkish in color. Then add the asparagus and give it a quick stir . Add in the cooked sambal, saute and mix in the water and the lime juice. Serve immediately. Note: Do not use all the oil from the cooked sambal. Otherwise, this dish would become too oily. 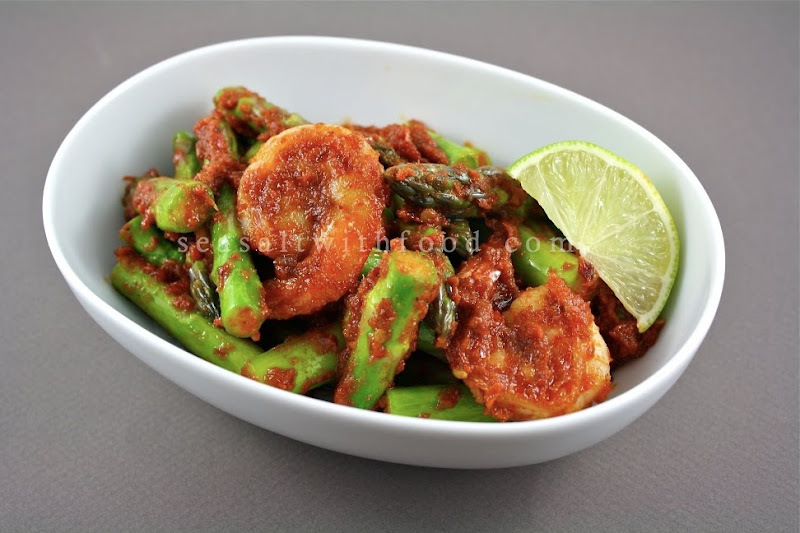 I made this kind of dish from asparagus before without belachan and we call sambal balado. @Indonesia-Eats: I like your recipe! Thanks.